I was diagnosed with Breast Cancer in December 2014, when my 2 sons were aged 2 and 6. Christmas was spent having fun but also recovering from my mastectomy and waiting for biopsy results. In 2015 I started my active treatment with included chemotherapy, radiotherapy, hormone therapy. Since then I’ve had my ovaries removed, gone through the menopause, had 4 lots of reconstructive surgery, developed osteoporosis and broke my back when out running, which meant the running had to stop! But, along the way, I’ve also had lots of fun with my kids who I savour all my times with. All my treatment and fun family times did mean I didn’t really focus on being activ e outdoors and setting a physical challenge to focus on for me. A chance meeting with someone from CCTA at an outdoors festival in 2016 changed that when they suggested that with their support I set myself a challenge. It took me ages to feel well enough, and to decide what I would want to do, during which time CCTA were patient, offering me very helpful prompts to sort out my challenge! 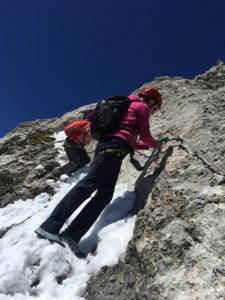 In 2017 after doing a Via Ferrata in the Lake District, I decided to book a trip on my own to The Dolomites to do two Via Ferrate out there. 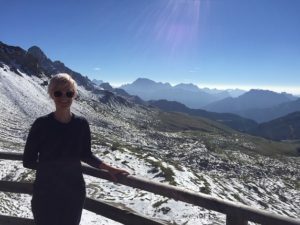 So, in August 2018 after the hard work of training, I flew out to Milan, picked up a hire car and drove myself up to Val di Fassa. The first Via Ferrata I completed was incredible. As someone who has only ever climbed indoors and never walked up a mountain outside of the UK, I was blown away by the beauty and scale of The Dolomites. 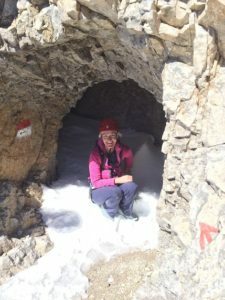 With my guide, I went up to see the shelters used in World War 1, scrambled through the snow in the sunshine and got a taste for wanting to push myself further the next day. On day 2 I did a more challenging route over Catinaccio d’Antermoia. After a long walk up the pass to the refuge, we began the Via Ferrate up to the summit at 3004m. I was very glad that I’d trained before my trip, as it was a physically demanding day. I walked and scrambled for around 20km that day, and felt incredibly lu cky to be well enough to be able to experience such fantastic scenery. On my trip back to the airport, I took the sightseeing route along Lake Garda’s shore, feeling tender but also chuffed to bits with what I’d achieved. 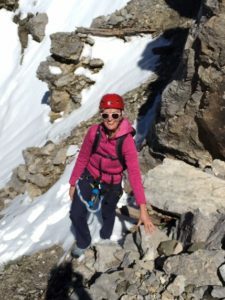 Challenge Cancer Through Adventure supported me not only financially, but also helped me hugely by encouraging me to make time to train and plan my trip. If they hadn’t done this, I know I wouldn’t have invested in myself and made the leap to go on my little solo adventure.